The printer uses a settings file named global.ini. This file contains settings that will be forced on to all users on the machine. Normal settings are specific to the user, whereas the settings in global.ini applies to all users. The last part of the path is the actual printer name it applies to. On different language specific versions of Windows the name ProgramData may be something different. You may find yourself in a situation where you are migrating your applications and data to a new workstation or server. The PDF printer may be part of this migration and you would like to know how to get the settings from the old machine to the new machine. In that case, this article is for you. 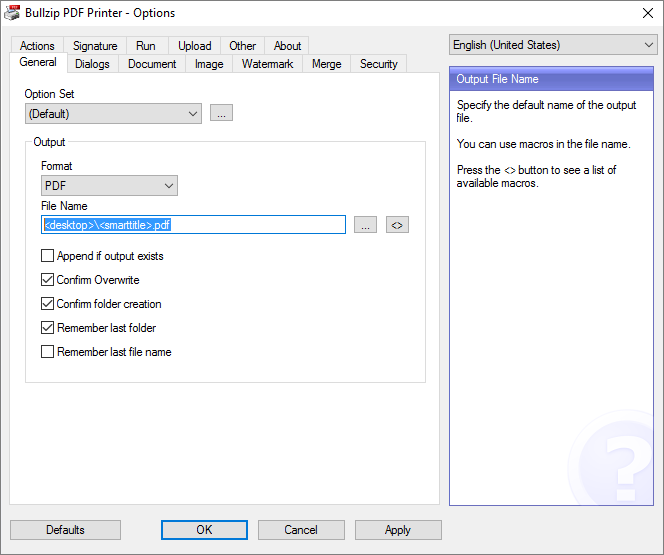 Unless you really have a good reason to install the same old version of the PDF printer as you had on the old system, I strongly recommend that you use the latest installer to install your new PDF printer. Download and install the latest available version before you try to move the configuration. The printer has a set of global settings and possibly some user specific settings to. In C:\ProgramData\PDF Writer\Bullzip PDF Printer you will find the global settings in a file named global.ini. You can copy this file to the same location on the new machine. These settings apply to all users on the system. 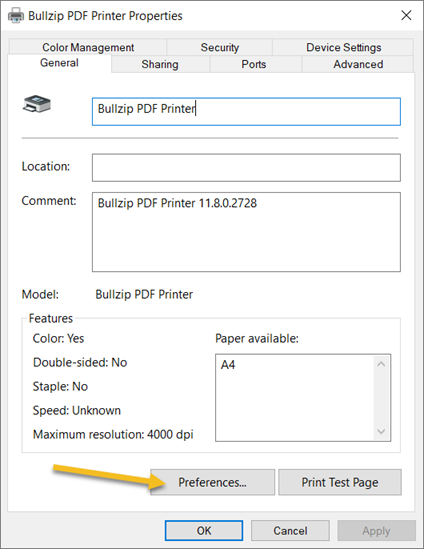 The users have their settings stored in settings.ini found in %APPDATA%\PDF Writer\Bullzip PDF Printer. Option sets shared between users are located in the folder C:\ProgramData\PDF Writer\Bullzip PDF Printer\Option Sets. The files can be copied to the new machine. By copying the files mentioned above, you should get a PDF printer behavior, which is more or less the same as on the old system. If you have a license on your old computer, you can move it to the new computer. The license file is named license.xml. It is located it the printer’s program folder. This is typically under C:\Program Files\Bullzip\PDF Printer. Simply move the file and you are done. When you create a PDF document your images are normally stored in a compressed format. 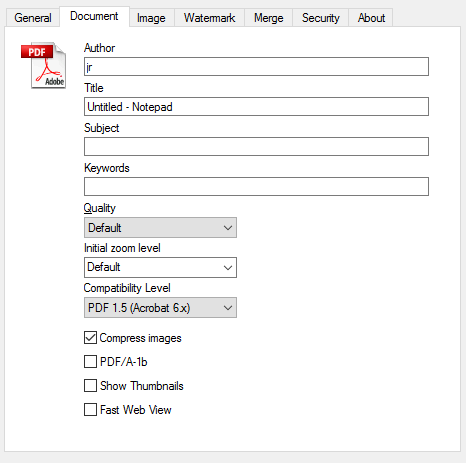 The PDF creation process basically chooses between two compression types. Depending on which types of images you have in your PDF, you may prefer one over the other. The JPEG compression is well suited for documents with photos. Images are compressed with a loss of information but it usually produces good pictures and reduces the size significantly. In contrast to the JPEG compression the FLATE compression is lossless. The images are preserved and it does not introduce the noise pixels along sharp edges as you will find when JPEG compression is used. Therefore, this type of compression is preferred if you have images of diagrams or images containing text. You can change the compression type, using different settings in the PDF configuration. If the Compress images is checked on the Document tab, then the JPEG compression is used. If you uncheck it, FLATE compression is used instead. The printer’s options dialog is where you configure all the default settings for the PDF printer. You open the options dialog from the Windows Start Menu. In Windows 10 you can open the start menu and start typing the word options. Then it will show up in the list. In Windows 7 you can also find the options dialog in the start menu. 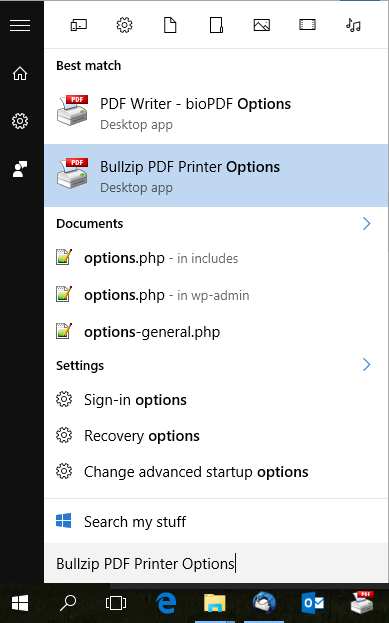 Browse to the Bullzip folder and click the PDF Printer menu entry. Once the dialog is open, you can start changing the default values. Click Apply or OK to save the changes. One of the great features of the PDF printer is that you can automate a lot of things. Hiding the print dialog is one of the popular things. It is very easy to do that. All you have to do is follow the steps listed in this article. You can open the options dialog from your Windows start menu. This is where you set all the default values that are used when the printer is activated. On the Dialogs tab you can specify when the dialogs should be shown. There are two dialogs: A Save As, which can be shown to just get a file name from the user. The settings dialog is the full dialog, which shows all the available features to the user. The dialogs will remain hidden if you set both settings to never. When the saving is automated then it needs an automatically generated file name. By default, the printer will save a document on the user’s desktop and create a name based on the document title in the print job. There are lots of different macros that you can use to create names automatically. You can also remove the Confirm Overwrite and Confirm folder creation to silence it even more. 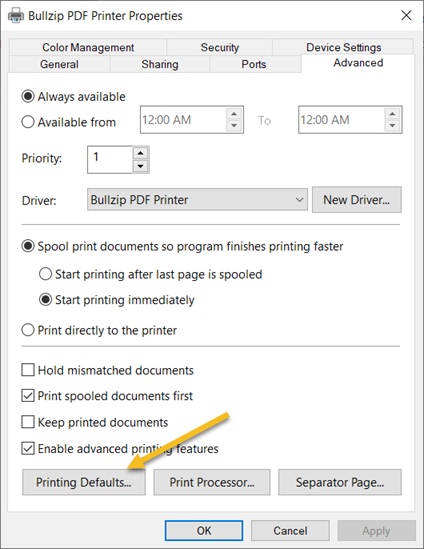 Click OK to save the settings for the next print job.